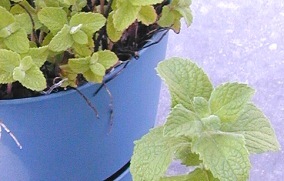 These two pots of mint show retarded growth due to lack of soil space. Both were planted last spring and should have been repotted earlier this year. Shown here in early summer, these plants are no longer productive. Had they been repotted in March, they would now be contributing copious amounts of mint for our culinary pleasure. A year old Egyptian Mint, below left, is dying from the center out due to lack of soil space. 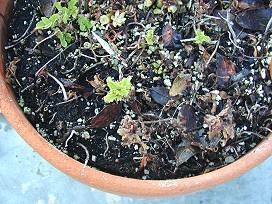 The Curly Mint, below right, has been in this pot for a year and is near death. The plant at the bottom on the concrete is a brand new three inch pot of Egyptian Mint. Notice how much bigger the leaves are than those of the stunted Egyptian Mint in the year old planter. This plant has completely formed itself to the pot. 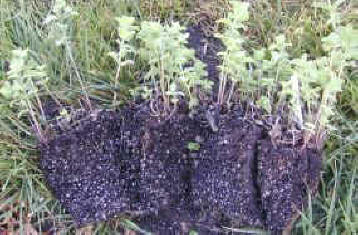 This is a sure sign that the plant is rootbound and has used all of the soil in the pot. See that white line that looks like a thick root? That is actually a mint runner looking for fresh soil. It can't find it within the pot so it is heading around the pot. Often this is when the plant escapes through drainage holes in pots. 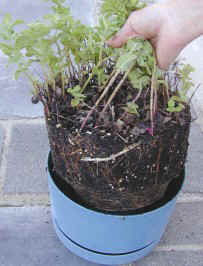 Save your hands and use a sharp spade to slice the original pot into quarters. Choose one of these to put back into your pot. It might also be necessary to cut off the bottom two inches of the dirt ball. 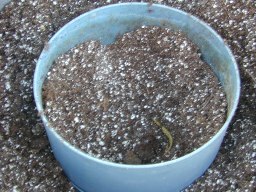 Use a good potting soil like the one pictured here. 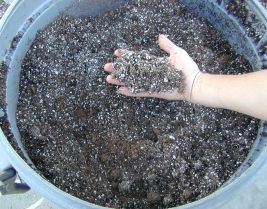 We use a mix of peat moss and perlite. Perlite is the white particle that is actually a heated rock that expands and puffs out, similar to the way corn pops. We have also added an organic fertilizer and moistened the mix. 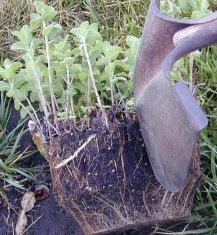 It helps to have the mix moist before planting to avoid having the plant swim in the potting mix while trying to get it wet. 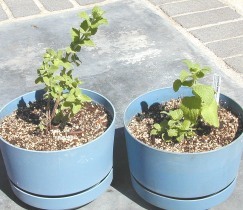 Here are the two new plantings of Egyptian Mint. One is the quarter of the old mint and the other is a brand new plant. Notice there is plenty of room from the soil line to the top of the pot for water. Water well and get ready for tea! 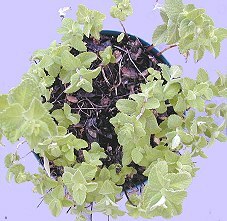 If your mint grows really fast, it may need to be repotted twice a year!